Accountant Jobs of Hassan Revenue Department. Selection for this VA jobs is based on merit in CBSE or ICSE 12th class marks. Merit list will be displayed in the month of January-2019. Official website to check merit list and application form submission online is hassan-va.kar.nic.in. 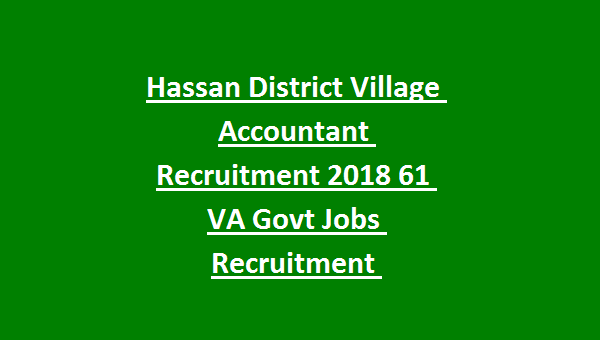 Brief information about Hassan District Village Accountant recruitment 2018 category wise vacancies, application fee, selection process and other details are given below. There are total 61 posts in this Hassan District revenue department VA jobs. CBSE or ICSE 12th qualified candidates are eligible to apply online for this Hassan District VA Jobs. Upper age limit is 35 years for general candidates and for SC/ST/Cat 1-40 years and for others 38 years. Candidates selection will be based on merit in CBSE or ICSE 12th class marks percentage. Short listed candidates are called for original documents verification and interview. 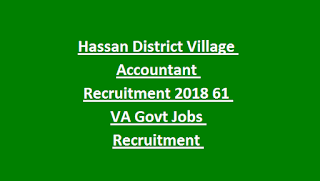 Candidates who are interested to work with revenue department of Hassan District they can apply online for this Village Accountant jobs via the official website of hassan-va.kar.nic.in before the last date of 20-12-2018.